The Fiat 500e promises to turn the EV world upside down with a blend of style and sporty driving characteristics that aren't typical in the EV segment. The fun to drive nature of the Fiat 500 has been built upon and enhanced with the addition of the electric motor's near instant torque output of 147 lb.ft - nearly 50 lb.ft more than the gasoline powered 500. Providing the energy to the liquid cooled, 83 kW, 3-Phase high efficiency AC motor is a 24 kWh hour liquid-cooled/heated 97 cell lithium-ion battery located just before the rear wheels. 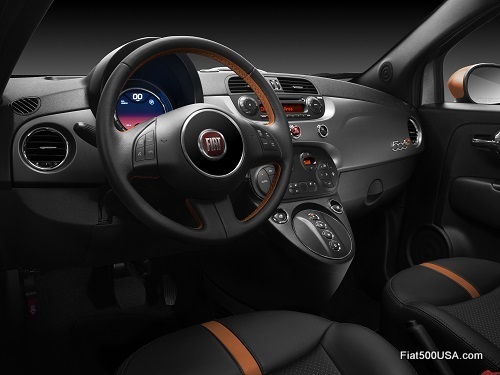 Cars with the e-Sport Package come with Nero interiors with Electrico Arancione Perla accents. The added weight of the battery pack gives the Fiat 500e a weight distribution advantage over the standard Fiat 500 (57/43 compared to Fiat 500’s 64/36). Fiat chassis engineers took advantage of the more equalized weight distribution and lower center of gravity provided by the battery pack and tuned the 500e for increased handling capability. Staggered wheel widths add to stability both during straight line driving and through cornering transitions. The Fiat 500 Abarth lends its ductile iron front control arms, reinforced rear axle beam along with its high performance brake system to the all electric 500e. By now you can tell there has been considerable emphasis on how the Fiat 500e drives and, judging by the number of Fiat executives that have picked the 500e as personal transportation, consumers are in for an immensely enjoyable driving experience. For those who want to build on the sporty nature of the 500e, Fiat offers the e-Sport Package. This attractive trim package features blacked out dot-matrix fascias and exterior lighting. Electrico Arancione Perla accents are used on unique black painted alloy wheels, mirror caps and lower body side stripe. The e-Sport Package is available in Argento, Grigio, Bianco Perla and Nero exterior paint. 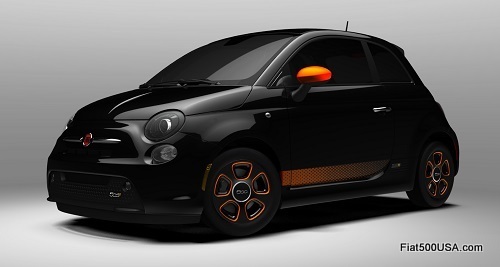 Interior color is black with Electrico Arancione Perla accents. The Fiat 500e may very well be the first EV with a serious performance aftermarket following, and I wouldn't be surprised if owners hit the track with the car. Stay tuned! Discuss on the Fiat 500e Forum! 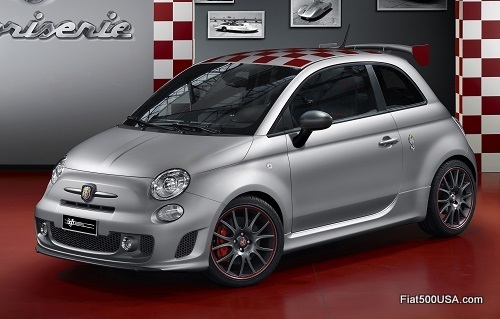 Benson FIAT: 500c Abarth Cabrios Arriving Now! 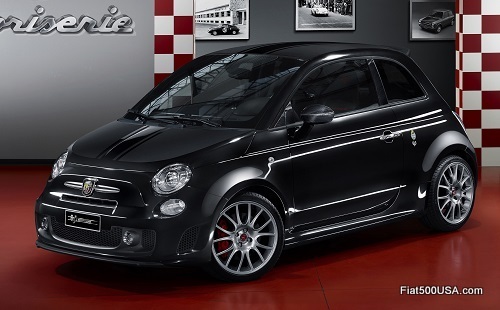 Fiat 500c Abarth Cabrio models have begun arriving at Fiat Studios across the country! 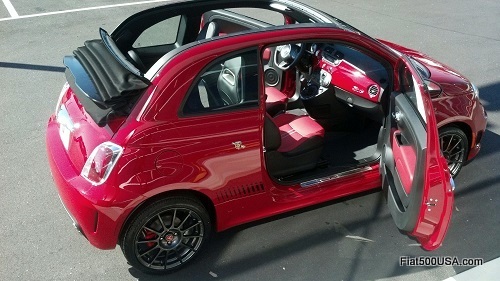 Benson FIAT of Greer, South Carolina dropped us a note to say they just received their new 500c Abarth Cabrio and wanted to share some images with us. 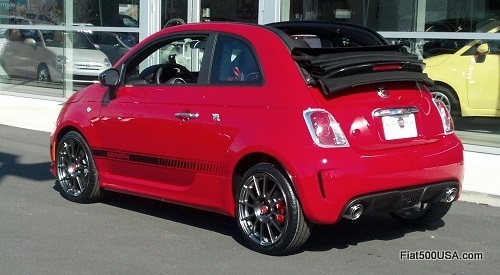 Particularly interesting is the Abarth's larger rear spoiler compared to the 500c Cabrio's. Benson FIAT expects to see more 500c Abarth Cabrios showing up in the next few weeks as Fiat gears up for the Spring selling season. 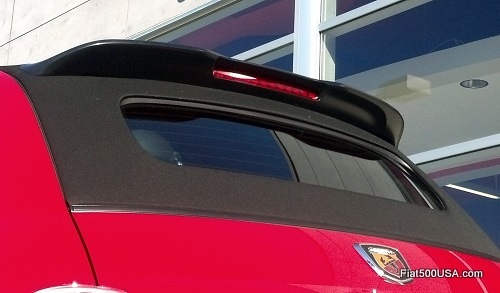 Fiat 500c Abarth Cabrio aggressive rear roof spoiler. Standard Fiat 500c Cabrio rear roof spoiler. Notice the different shape. 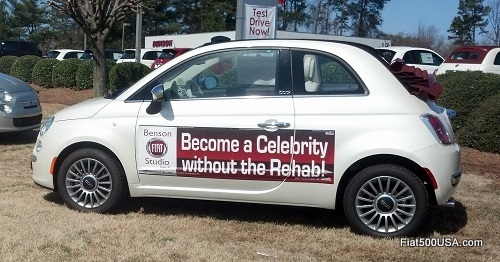 The Benson FIAT Studio opened in June 2012 and under the leadership of Studio Manager John Montgomery, has quickly become one of the highest volume Fiat Studios in the Southeast. The name John Montgomery will sound familiar to Fiat fans in the know because John is also the President of the FIAT Club of America, the largest and most active Fiat club in North America. John brings his passion for the brand to Benson and also his creative approach to marketing. 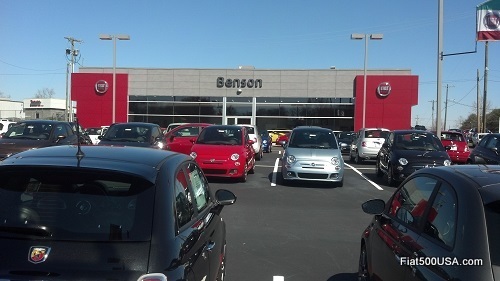 For example, Benson Fiat has a unique "Fly and Drive" program, where you can fly in and drive home in a new Fiat 500. Benson FIAT will provide up to a $250 travel allowance so you can fly into Greenville-Spartanburg International Airport, stay at a hotel in nearby Greer, SC and then will pick you up and have your Fiat 500 detailed, fueled and ready for you to drive home! They'll even locate a car in the Southeast for you. It is a terrific way to buy a car and is giving Benson FIAT a reputation as an enthusiast's dealer. The above video and image showcase Benson FIAT's fun and enthusiastic approach to marketing the Fiat brand. Benson FIAT is part of a family owned business that stretches back to when Jim Benson opened his first car dealership in 1946. Today, Benson has the largest Chrysler-Dodge-Jeep dealership in South Carolina along with Ford, Nissan and Cadillac dealerships located throughout the state. Situated behind the Fiat Studio is Jim Benson's Memory Lane Car Museum, one of South Carolina's most celebrated car collections. This private museum is occasionally opened to the public for special events and tours and is well worth a trip just to see. We're happy to welcome Benson FIAT to our list of the top Fiat Studios in the country. Make sure you stop by and say hi to John and his team! The official 2013 Fiat 500 and Fiat 500 Abarth Accessories Catalog is hot off the presses and here for your enjoyment! It is well known that the Fiat 500 is one of the most customizable cars on the planet, with more than 500,000 possible combinations of trims and accessories available when it is ordered, but it doesn't stop there! Once you get your Fiat, there is a whole range of accessories you can add whenever the mood hits. Below is the official Fiat Mopar Accessories Catalog to browse through to help get those creative ideas flowing. Sporty, mild or wild, it's all in the catalog. The parts are genuine Fiat accessories so you don't have to worry about fitment and they are all available through your local Fiat Studio. Make sure you call or drop by your Fiat Studio for up to date information. 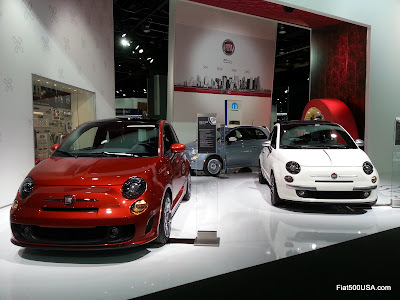 or go to the Fiat USA website here to find your nearest dealer. For the sixth year in a row, Fiat has recorded the lowest level of CO2 emissions of any major European car company. According to JATO Dynamics, the world's leading provider of automotive intelligence, for 2012, Fiat has achieved an average CO2 reading of 119.8 g/km. Since 2006, Fiat has reduced its average CO2 level 13 percent from 137.3 to 119.8 g/km. For perspective on why this is noteworthy, the European Union has set a standard of 130 g/km for 2015. Another Fiat initiative is targeted at increasing driver awareness on how their driving habits impacts fuel efficiency and CO2 emissions. Called eco:Drive, this downloadable application allows owners to monitor how they drive and offers tips and advice to help improve efficiency. The inter-active program is a fun way to save money, reduce CO2 emissions and increase driver enjoyment. There are 90,000 eco:Drive users on the road and they are saving 5.000 tons of CO2 per year. 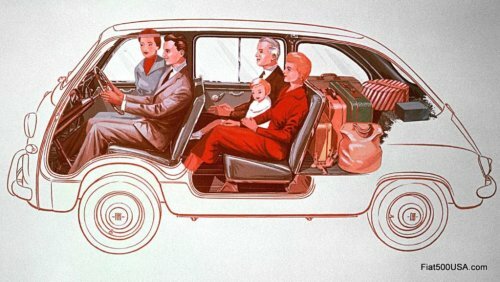 The 1955 - 1965 Fiat 600 Multipla could seat up to 6 people inside its 139 inch length - the size of a modern Fiat 500. All this should come as no surprise as Fiat has a long tradition of being a socially conscious car company throughout its 114 year history. Examples are the 1912 Fiat Tipo Zero - a car that put Italians on the road and is referred to as Italy's Model T, but whose advanced design was closer to a 1930's Model A. There is the 1935 Fiat 500 - a car designed from the inside out making it the first modern small car. Of course, we know about the 1957 Fiat 500 that gave Europeans the ability to own a real car after the war, and we can't forget all the modern Fiats whose combination of roominess, safety and fuel efficiency have transported millions of families for decades. But what is even more outstanding, is Fiat has done all the above while continuing to produce cars with immense character that are full of life and fun to drive. 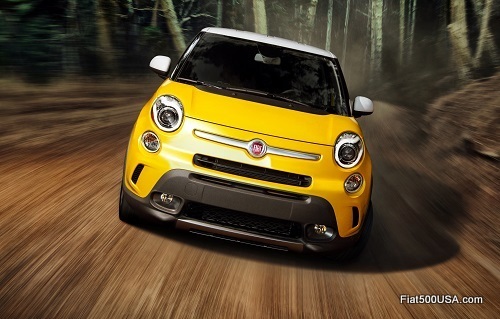 This ability to be ecological without sacrificing style and enjoyment are what separates Fiat from other manufacturers. 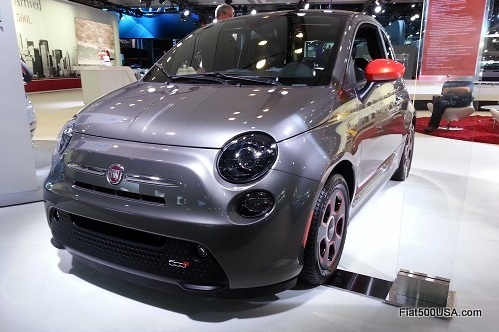 You see it in the Fiat 500 of today and the upcoming 500L and 500e in the near future. The Abarth display at this year's Geneva Motor Show highlights their new Fuoriserie program and the hot new Punto Supersport. The Abarth "Fuoriserie" or "Special Production" program enables Abarth 500 owners to design and customize their cars for a unique Abarth experience. Abarth Fuoriserie cars are based on the Abarth 695 series and feature an upgraded 180 hp T-Jet engine, the paddle shifted automated manual 5-speed C510 “Abarth Competizione” gearbox, large Brembo 4 piston caliper front brakes, Koni suspension and Magneti Marelli variable back-pressure dual mode exhaust. Carbon fiber trim and a Harman’s JBL audio system are part of the interior package. From there, Abarth owners can choose from a unique selection of colors and materials not available in the standard Abarth 500. A look at the Abarth "Fuoriserie" or "Special Production" program. The good news is there is talk that this series will be rolled out to other countries outside of Europe! Stay tuned! Abarth offers two customization themes to select from - Heritage Collection and New Wave - each version has a unique flavor. The Heritage Collection is inspired by the legendary Abarth championship cars from the past. The New Wave design theme draws its inspiration from the modern world of sports and supercars. 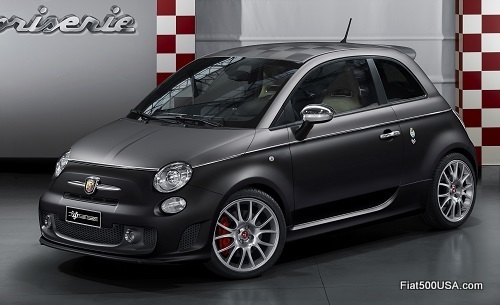 At Geneva, Abarth brought out two examples of each theme: Abarth 695 'Record' and Abarth 695 'Scorpione' for the Heritage Collection, and the Abarth 695 'Hype' and Abarth 695 'Black Diamond' showcasing New Wave . Capturing the spirit of Abarth record-breaking race cars of the past, the Abarth 695 'Record' sports Matte Competizione Grey paintwork and a traditional Abarth checkerboard roof. Matte black wheels and red Brembo brake calipers accent the design. 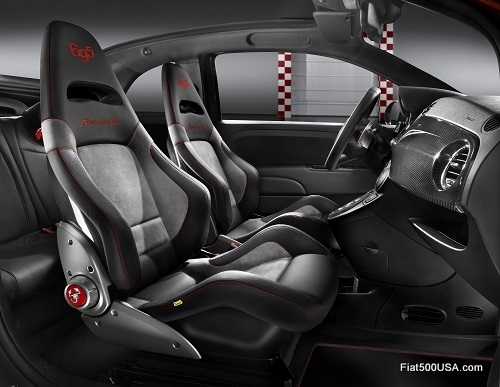 Gorgeous 'Abarth Corsa by Sabelt' seats in black leather with red Alcantara insert and stitching dominate the interior. Gloss carbon fiber is lavished on the seat shells, kick plates, dash and gear panel. The parcel shelf also receives attention and is finished in red. Giving a nod to the legendary Abarth street cars from the 70s, like the 124 Abarth, this Abarth creation features a matte black hood with an added racing stripe on top of gloss black paintwork. Exterior details, like the mirror caps and door pillars, are finished with gloss carbon fiber inserts. The 17x7 alloy wheels are Magnesium-colored and are set off by red Brembo brake calipers. 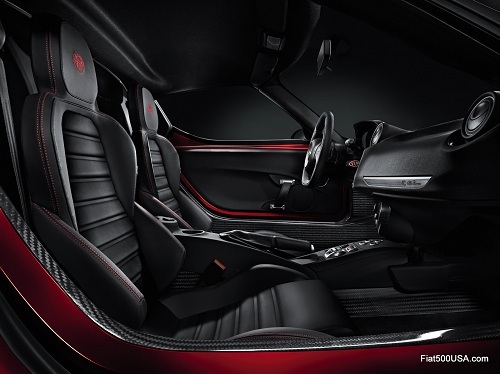 Sabelt seats in black leather and perforated grey Alcantara are adorned with 695 and 'Fuoriserie' logos in red. 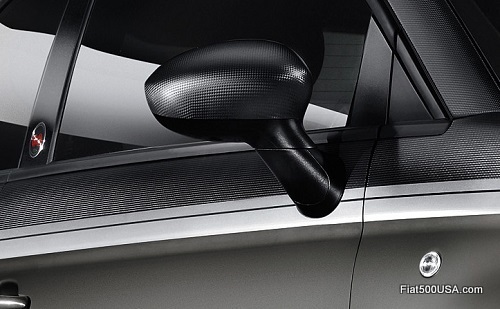 Matte carbon fiber is used in lieu of the gloss carbon fiber of the 695 'Record.' Leather is used to trim the rear parcel shelf. 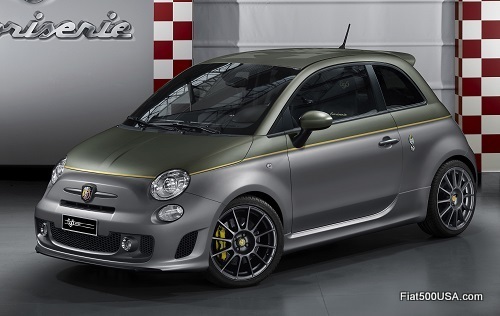 The Abarth Fuoriserie New Wave collection is well represented with the Abarth 695 'Hype'. Matte Record Grey paint is topped with Matte Green and a yellow stripe and give the car a tough, yet elegant look. Titanium colored wheels and trim are used along with yellow brake calipers. An enormous roof mounted Scorpion logo complete the look. 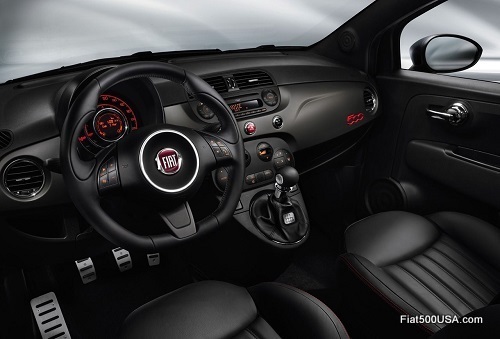 The interior features black leather 'Abarth Corsa by Sabelt' seats with olive green Alcantara inserts. Yellow is used throughout as interior accents, and gloss carbon fiber is called upon to finish the seat shells, kick plates, dash and gear panel. 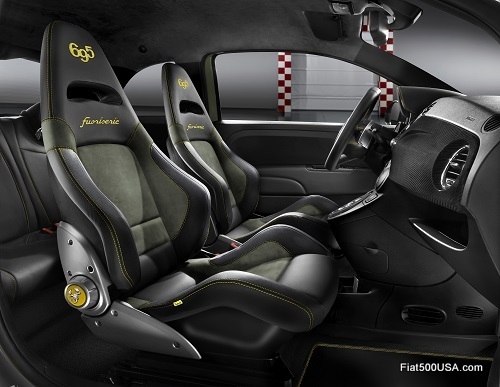 The final Abarth Fuoriserie creation is said to be targeted towards its female fans. It brings together Matte Record Grey and Scorpione Black paint separated with a unique horizontal chrome accent moulding. Chrome is also used for the mirror caps and continues the sophisticated theme. The 'Black Diamond' wears magnesium finished wheels highlighted with traditional red painted calipers. A subtle gloss grey chequered flag on the roof is the finishing touch. Abarth sport seats are in sand beige leather and feature '695' heat printed into the head restraints. As is popular with 695 series cars, the parcel tray is customized and covered in leather and sports a silver embroidered logo. Matte finished carbon fiber is used for the interior trim. The new Abarth Punto Supersport on display at Geneva shows off its new wheel design and subtle updates for 2013. The Punto Supersport is a B segment hot hatch and uses the 180 HP 1.4 L MultiAir Turbo, similar to the engine in the US Fiat 500 Abarth. The 2013 Punto Supersport adds optional gloss-matte paintwork on the roof, hood and 5-"claw" wheel design, matte black interior paintwork and Brembo brakes. 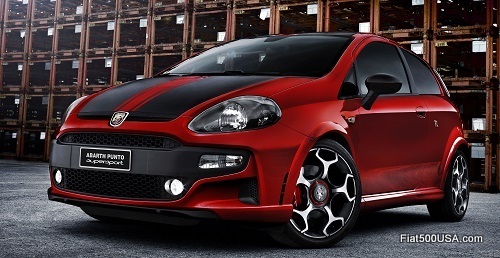 The Abarth Punto Supersport would be a terrific addition to the Abarth lineup here in the US as it would give current 500 Abarth owners a way to trade up and stay within the Fiat Group while they work their way towards a new Alfa Romeo. The Punto Supersport's exotic look makes a GTI look bland and unexciting in comparison. It's a long shot, but we can only hope! 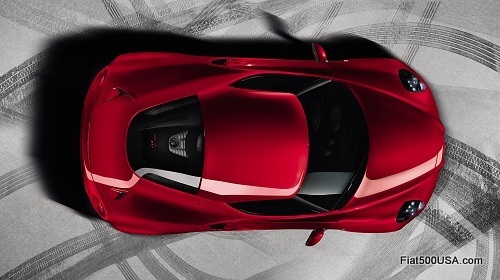 Alfa Romeo launched their spectacular 4C sports car today at the Geneva Motor Show. 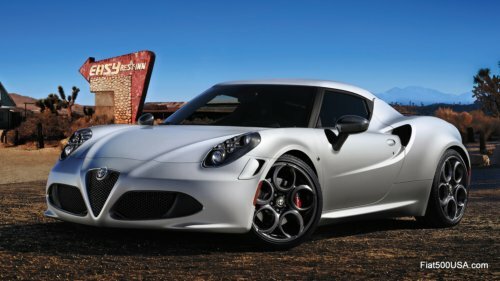 Deliveries of the new Alfa Romeo 4C will begin in the US by the end of the year - the perfect holiday gift for yourself! Here is the video presentation plus the full press release for your enjoyment. The exclusive ‘Launch Edition’ will make its début at the Geneva Motor Show. It will be produced as a numbered limited edition: 400 in Europe, Africa and the Middle East, 500 in North America and 100 in the rest of the world. Dedicated to the host of fans throughout the world, the limited edition of the new Alfa Romeo compact supercar is distinguished by exclusive characteristics such as carbon fibre trim and the ‘Carrara White’ body colour. The 4C ‘Launch Edition’ can be ordered straight away at a price which is almost the same throughout Europe, 60,000 euros including VAT (net of other local taxes). A unique privilege exclusively for 4C ‘Launch Edition’ buyers: the chance to take part in an exclusive event in Italy which also includes an Advanced Driving session with Professional Driver-Instructors. New all-aluminium engine: direct-injection 240 HP 1750 Turbo Petrol. Top speed of more than 250 km/h and acceleration from 0 to 100 km/h in 4.5 seconds. Alfa TCT twin clutch transmission with shift paddles at steering wheel and new Alfa DNA selector with additional ‘Race’ mode. The global launch of the Alfa Romeo 4C marks the return of the brand to the world of lightweight sports coupés, an extraordinary event, awaited ever more eagerly by the host of fans throughout the world. The exclusive ‘Launch Edition’ was created just for them, a numbered limited edition of 400 in Europe with exclusive characteristics developed specifically for this unique version. It makes its début today, at the 83rd Geneva International Motor Show, where orders officially opened for the ‘Launch Edition’ of the new 4C compact supercar at a price of 60,000 euros in most European markets (price including VAT net of other local taxes). What’s more, all buyers can take part in an exclusive event which will include an advanced driving course, to learn how to make the most of its potential in complete safety. The new Launch Edition can ‘clothe’ its body with two liveries – Carrara White or Alfa Red – and is marked out by the distinctive badge, inlaid beneath the paintwork. The line of the special car is enhanced by the carbon aerodynamic kit (including spoiler and door mirror covers), the rear aluminium diffuser with dark finishing, Bi-LED headlights with dark surround and 18" (front) and 19" (rear) alloy wheels with burnishing treatment. To accentuate the sports look still further, there are front air intakes, brake calipers in a specific colour, racing exhaust system with BMC air cleaner and suspension kit with specific calibration for shock absorbers and rear anti-roll bar. The interior has the same sports feel, with highlights provided by the leather/fabric sports seats with parts in Alcantara, as well as the distinctive, numbered carbon badge. In the case of the red livery, the Alfa Romeo 4C Launch Edition has red stitching on the steering wheel trim, handbrake, mats, handles and sports seats. Of course, the Alfa Romeo 4C Launch Edition offers all the winning characteristics of the model that represents the essential sportiness embedded in the ‘Alfa Romeo DNA’: Italian style, performance and technical excellence, for maximum driving pleasure in complete safety. Designed by Alfa Romeo and produced in the Maserati plant in Modena, the new mid-engined rear-wheel drive coupé with two bucket seats will be become available for purchase in 2013 and will mark the return of the Italian brand to the United States, inaugurating Alfa Romeo’s global growth plan. The Alfa Romeo 4C derives directly from the concept which raised many eyebrows in admiration at the Geneva Show in 2011, so much so that it won three prestigious awards: the ‘AutoBild Design Award’ (2011, Germany), the ‘Design Award for Concept Cars & Prototypes’ (2012, Italy) and the ‘Most Exciting Car of 2013’ - ‘What Car?’ (2013, Great Britain). The acronym ‘4C’ draws its inspiration from the brand’s glorious past, projecting the values of technology and emotions into the future. Indeed, it refers to Alfa Romeo’s great sporting tradition: the acronyms 8C and 6C in the 1930s and 1940s distinguished cars – both racing and non – fitted with the powerful ‘eight cylinders’ and the innovative ‘six cylinders’, confirming in its design layout and construction the goal of achieving the weight/power ratio of an authentic supercar, less than 4 kg/HP, yet focusing not merely on the maximum power delivered, but on limiting the weight to guarantee maximum agility and top performance. To this end, the Alfa Romeo 4C uses state-of-the-art technologies and materials derived from super sports cars (including the Alfa Romeo 8C Competizione) – carbon fibre, aluminium, rear-wheel drive – and technologies from the latest standard models from Alfa Romeo, but updated to enhance the sports appeal of the new car even further. This is demonstrated by the new 1750 Turbo Petrol all-aluminium engine with direct injection, the sophisticated “Alfa TCT” twin dry clutch transmission and the Alfa DNA selector with the brand-new Race mode. Designed by the Alfa Romeo Style Centre, the 4C immediately brings to mind some of the traditional iconic models which have left a significant mark in the history of the Brand. 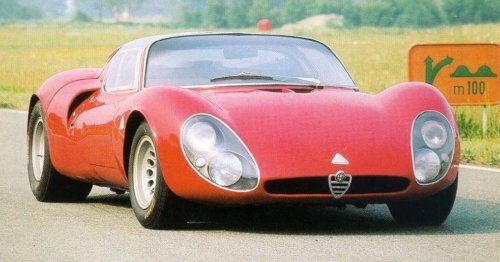 Above all others, in terms of dimensional and layout similarities, one stands out in particular: the 33 Stradale, a car that combined extreme mechanical and functional requirements with an essential style which “clothed” the engine and chassis appropriately with unmistakable Alfa Romeo treatments. The 4C has followed suit, and thus completes a journey which was embarked upon with the 8C Competizione, emphasising some particular concepts of the brand, such as compact size, dynamism and agility. The development of the 4C’s exterior was characterised from the start by the need to enhance the style of the car and the technical characteristics both from a dynamic and aerodynamic point of view. For this reason, all the style solutions adopted have been optimised in accordance with the ultimate goal of the car: performance. The rear volume, sinuous and enveloping, simultaneously encloses and embraces the beating heart of the car: the mechanics and the engine, visible through the rear window. All this, thanks to the development of marked musculature above the wheels, lends strength and power to the rear end. The rear musculature supports its structure on round rear light clusters and on the side air intakes necessary to cool the intercooler and the air intake for engine aspiration. From this energy-charged rear volume and the two side air intakes spring the two long muscles which lend speed and dynamism to the side, generating the necessary volume at the front end to house the headlights and, on the central part, the two robust ribs running along the bonnet, tracing the unmistakable “V” and coming to their natural conclusion around the shield. This, together with the two side intakes, forms the famous “Trefoil”, a substantial facet of Alfa Romeo’s profile. The elemental design and essential materials also distinguish the interior, which is all designed and built for maximum driving satisfaction. Specifically, the carbon fibre of the central cell immediately stands out in the interior, left in full view to enhance the sense of low weight, technology and uniqueness of the car. The dashboard and door panels have an “asphalt ” treatment to recall the vocation of the Alfa Romeo 4C, conceived to convey maximum driving sensation from the road. The seats ensure dedicated sports posture, favouring the driver’s contact with the road without, however, compromising the comfort required for everyday use of the car. The dashboard, simple and designed to make using functions simple too, reaches its zenith in the concept of extreme driver-orientation, thanks to digital instruments and gear shift controls located on the appropriately shaped steering wheel. The cockpit, which powerfully suggests the world of motorcycle racing and race cars, brings together all information necessary to drive and control the car. The information, which is rendered captivating through powerful, high-impact graphics, allows the driver to keep everything under control without distractions from controls that would be superfluous on this type of car. The pedal unit and footboards for driver and passenger are all made of aluminium and embellish the lower part under the dashboard, highlighting sports character down to the smallest detail. The compact dimensions make this car with 2 bucket seats truly unique among its competitors: 399 cm long, 200 cm wide, 118 cm high and with a wheelbase of 238 cm. These dimensions serve both to emphasise the car’s “supercar proportions” and to accentuate its agility. What’s more, owing to the designers’ excellent work, the car achieves maximum aerodynamic efficiency levels, guaranteeing a negative Cz which, as in racing cars, contributes towards achieving increased stability at higher speeds thanks to the aerodynamic downforce. The engine is the beating “heart” of an Alfa Romeo. In this case, it’s the new direct-injection 240 HP 4-cylinder 1750 Turbo Petrol, which was designed with a precise objective: to ensure exceptional performance without sacrificing driving fluidity and use in any circumstances, from the racetrack to the city streets. 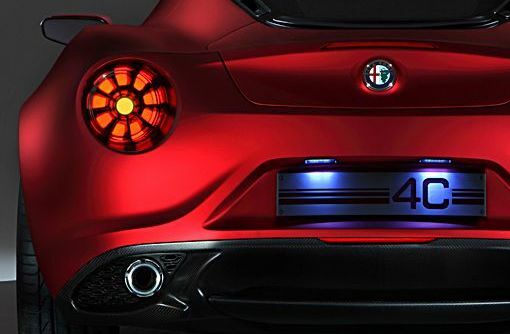 The Alfa Romeo 4C’s new mid-engine, all-aluminium power unit adopts specific optimised intake and exhaust systems, to enhance both response at low speeds and extension, with the assistance of a crankshaft with eight counterweights. In addition, it boasts cutting-edge technical solutions including direct petrol injection, dual (intake and exhaust) continuous variable valve timing, a turbocharger and a revolutionary scavenging control system that eliminates turbo lag. Torque delivery is generous, with a peak of 350 Nm, 80% of which is available at only 1700 rpm. The 1750 Turbo Petrol engine is teamed with the Alfa TCT twin dry clutch transmission, which is a genuine benchmark in the category due to its limited weight and extreme speed of activation. The gears can be changed in sequential mode using the “shift paddles” located behind the steering wheel. Compared to the version already adopted on the Giulietta and MiTo models, the TCT on the Alfa Romeo 4C implements next-generation software and features the new ‘Launch Control’ function that optimises all car systems to provide the utmost acceleration possible. What’s more, to ensure the best performance in accordance with the road conditions and driving style, the Alfa TCT adopts optimised operating logic, interacting with the Alfa DNA selector, the braking system, the engine management system and the vehicle stability control system. For example, in automatic mode, the shifting logic differs according to the Alfa DNA setting. 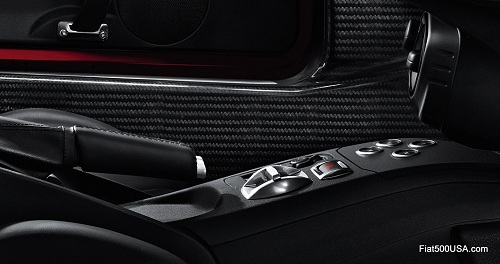 A specific evolution of the Alfa DNA selector has been developed for Alfa Romeo 4C, which not only features the three standard settings available on other models in the range – Dynamic, Natural and All Weather – but also a fourth mode: ‘Race’, designed to enhance the driving experience on a racetrack even further. It only takes a long press of the selector in Dynamic position to activate it: in this mode, the Alfa DNA deactivates the stability control and anti-slip systems, leaving the driver in full, exciting control. Finally, the full-digital instrument panel with TFT display changes configuration - showing only information relevant to the chosen mode - and colour in line with the Alfa DNA setting: yellow for Race, red for Dynamic, grey for Natural and blue for All Weather. A stiff, strong but light structure is an essential pre-requisite for a high-performance sports car. 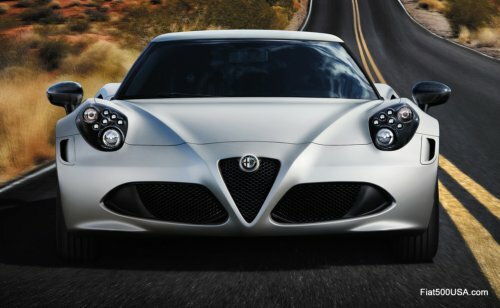 The same principle inspired the creation of the Alfa Romeo 4C. A state-of-the-art combination of hi-tech materials of extraordinary stiffness and strength, together with a very low specific weight, was selected to achieve this result. In particular, the chassis is a monocoque made entirely of carbon fibre with ‘pre-preg’ technology derived from Formula 1 and adopted only by the most advanced supercars, which weighs only 65 kilograms, inside which a space is formed for the driver and passenger. The front and rear structures of the chassis and the roof reinforcements are made entirely of aluminium. Additionally, the car’s bodywork is made entirely of low-density, high-strength composite material. Benefits of using this material include lighter weight (it is 20% lighter than steel) and resistance to corrosion. Dimensional stability is comparable to steel and better than aluminium. Finally, the seats have a mixed carbon fibre and fibreglass structure which guarantees high resistance to stresses and a particularly low weight at the same time. The final result is a significant reduction in overall weight (the dry weight is just 895 kg) combined with the best possible torsional stiffness and strength characteristics, as well as the optimisation of the car’s centre of gravity, which gives the advantage of increased agility and drivability on the most challenging roads. The Alfa Romeo 4C has an extremely sophisticated suspension layout – ‘superimposed wishbones’ at the front, development of MacPherson at the rear – to ensure maximum agility and road holding. This solution, along with the rear-wheel drive and the extraordinary weight to power ratio, ensures Alfa Romeo driving pleasure, enhanced even further by the weight distribution (40% on the front axle and 60% on the rear axle). What’s more, for those wanting the maximum in terms of handling, a complete suspension kit will be available with a specific calibration of the shock absorbers and rear anti-roll bar. To ensure decisive braking even under the most intensive conditions, the braking system has four self-ventilating perforated discs, with Brembo four-piston aluminium calipers on the front axle. In addition, to “stick” the car firmly onto the road surface, tyres with a different diameter and width depending on whether they are fitted at the front or rear have been fitted (two variants possible, either 17"-18" or 18"-19") which were developed especially to guarantee excellent performance (a kit of tyres with a softer mix is also provided for optimised grip). In line with the car’s setup, the steering system of the 4C does not feature power steering, to save weight but above all to secure a superlative driving feel. An appropriate steering wheel load is maintained thanks to the low overall weight of the car. The implemented state-of-the-art technical and technological solutions drive the Alfa Romeo 4C to reach real supercar performance with a unique driving feel. This is demonstrated by a top speed in excess of 250 km/h, only 4.5 seconds to accelerate from 0 to 100 km/h, 1.1 of side acceleration on corners and 1.25 g of maximum braking deceleration. The very best technical and industrial expertise of the Alfa Romeo and Maserati brands was used to develop the Alfa Romeo 4C. Specifically, the teamwork between the two brands was aimed at the integration of the Alfa Romeo design department with the Maserati production plant. This was boosted by the technical and technological contribution of other Italian companies, international leaders in the sector of high-performance sports car components. In short, this too is a distinguishing trait of Alfa Romeo, a brand with a century of history that continues to be one of the most famous and popular ambassadors of Italian products across the world. Here is a preview of the new Alfa Romeo 4C vehicle configurator. 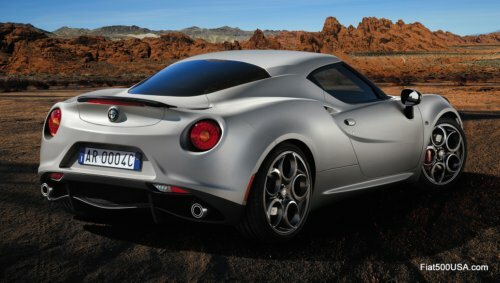 Just the thing to daydream over while we wait for the 4C to hit American Alfa Romeo dealers by the end of this year. Fiat will have three world premieres this week at the 83rd International Motor Show in Geneva: the Fiat 500 GQ, the 500L Trekking, and special editions of the Panda 4x4. 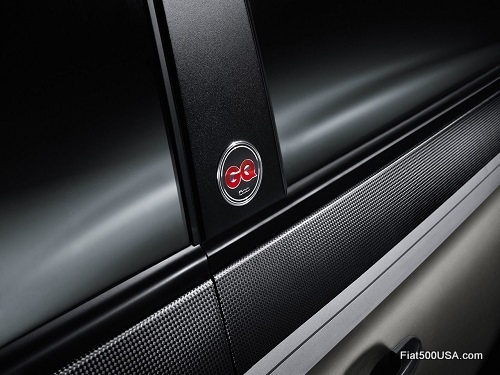 For the Fiat 500 GQ, Fiat teamed up with Gentlemen's Quarterly to produce a car with sophisticated good looks. 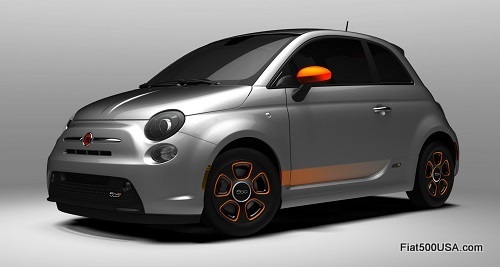 This special edition Fiat 500 is set off by a wild two tone paint scheme in matte grey and black carbon fiber look. The unique paint treatment is also applied to the mirror caps, and there are exclusive "GQ" logos on the B pillars and orange 500 logos on the alloy wheel centers. Additionally, cars equipped with the 100 HP 1.4 engine have orange painted brake callipers. 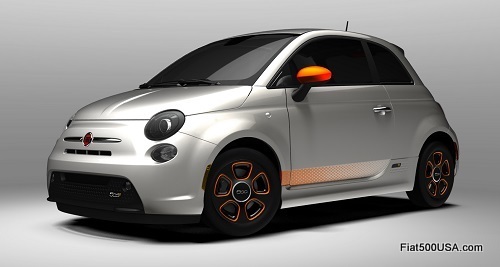 Inside the Fiat 500 GQ, orange "GQ" logos adorns the matte grey dashboard and leather seats. The seats feature signature "GQ" orange colored stitching. A flat bottom sport steering wheel reminiscent of the 500 Abarth's wheel, along with aluminum sport pedals and a special leather shift knob round out the interior changes. Engine choices for the 500 GQ are the 69 HP 1.2 L EasyPower, the 85 HP 0.9 L TwinAir Turbo and 100 HP 1.4 L 16V petrol engines, as well as the 95 HP 1.3 L 16v MultiJet diesel. 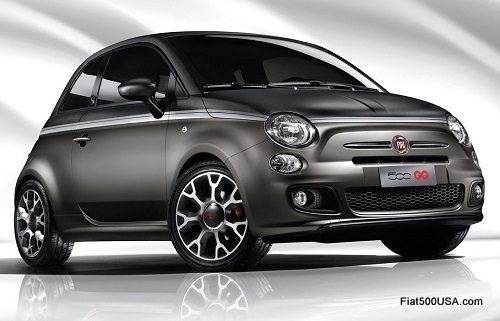 Look for the Fiat 500 GQ to go on sale in Europe in June. 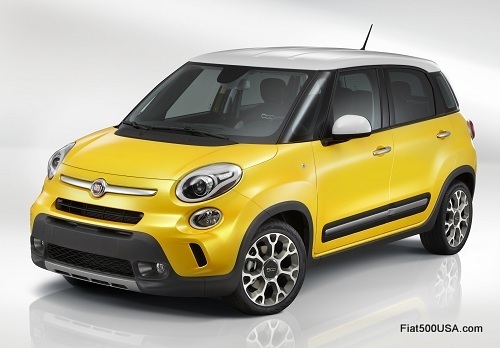 The Fiat 500L Trekking also makes its European debut at Geneva. The Fiat 500L is doing exceptionally well in the sales department, with more that 38,000 units sold in five months - over half outside of Italy. It is the only model in its segment in Europe that has had consistent sales growth, despite the current economic conditions. Recently, the 500L was named 'New Model of the Year 2013' by readers of the Italian automotive magazine Quattroruote, beating out the best of its German competitors. 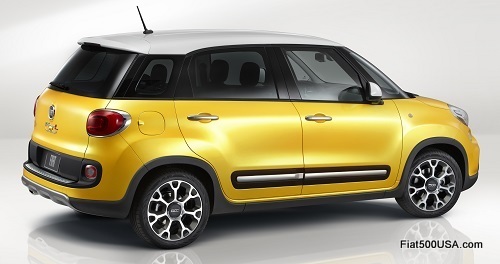 Four versions of the Fiat 500L will be available when it arrives in America this June: Pop, Easy, Trekking and Lounge. Of the four models, the mid-range Trekking is expected to be the most popular. 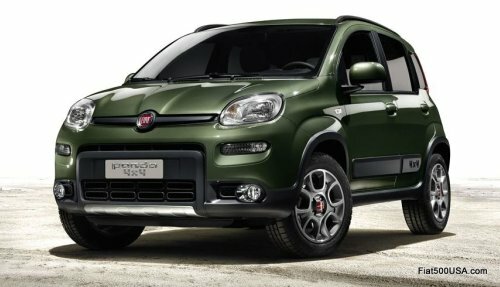 Another car Fiat is highlighting at Geneva is the recently introduced Fiat Panda 4x4. The Fiat Panda is the number one selling A segment car in Europe and the Panda 4x4 is Europe's only 4x4x city-car. Introduced in 1983, the Panda 4x4 has earned a reputation as a go anywhere - do anything vehicle over the last thirty years. The drivetrain features a six speed manual gearbox with an ultra-low first gear to get the Panda 4x4 out of just about any situation. This is teamed up with the "Torque on demand" traction system that uses ELD (Electronic Locking Differential) and ESC (Electronic Stability Control) to distribute torque to the wheels with the most traction. The rear suspension uses a new patented torsion beam design that offers an improved ride over last year's model, yet retains the flexibility needed for off-roading. In December, the Fiat Panda 4x4 was awarded 'SUV of the Year 2012' by Top Gear magazine. Expect to see three Panda 4x4 showcars at Geneva painted in distinctive two-tone paint schemes: three-layer white, three-layer red and two-tone green/beige. We'll have more images when the show opens later this week. Check back! * I updated this story to clarify the Traction+ feature availability for North America. Fiat 500 sales this year continue their upward trend, with February 2013 sales of the Fiat 500 setting an all time high for the month. Sales of the Fiat 500 last month were 3,302, up 2 percent over last year's February sales and is the 12th consecutive month that the 500 has set a sales record. Additionally, February's sales figure shows a 32 percent increase over January's sales, bringing the year to date total of all Fiat 500 models sold in the US to 5,805, a 13 percent increase over the same period last year. "Despite the return of the affordable rear-wheel-drive sports car at Subaru and Scion, it’s actually a front driver that gets our nod for Best Sport Coupe, the Fiat 500 Abarth. And that’s because even with front-wheel-drive, it tackles the road better. The Abarth looks mean, sounds great, and of course, handles way better than any of us expected. All while getting 34 miles-per-gallon, offering a surprising amount of storage space, and costing a couple grand less than the FR-S and BRZ."